artSMart: I HEART THE 80’S BACK BY POPULAR DEMAND! I HEART THE 80’S BACK BY POPULAR DEMAND! 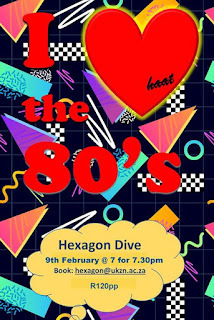 I Heart the 80s is back at the Hexagon again after breaking Dive box office records in December! Remember the big hair, big shoulders, big music, big egos? 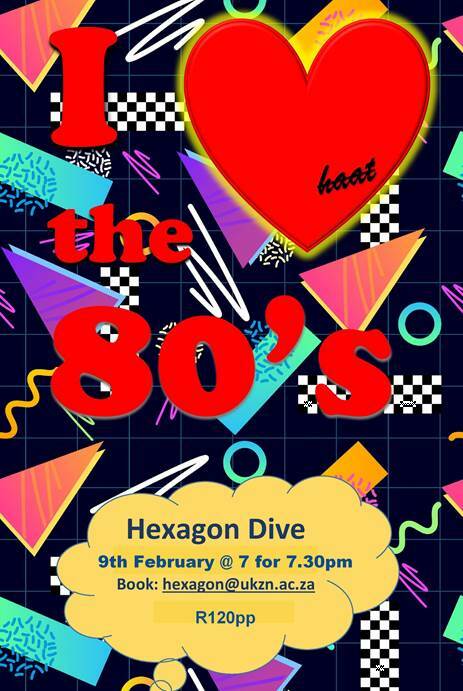 The Just Theatre group brings you their 20th annual Dive show, this time celebrating the 80’s! The cast of eight, all of whom have made their mark on the local music scene, as well as been involved in many previous shows , consists of Ryan Calder, Erin Fourie, Sandra Styles, Helen Vermaak, Daniel Rossouw, Tammy Calder, Katherine McClelland and Brandon Bosch. All brilliantly accompanied by top notch guitarists Calder and Rossouw. These popular musicians and singers look back at the songs and singers that made the 1980’s: the anthems, the power ballads, the boy bands and girl bands, the serious musicians, the movies and the musicals. The show is jam packed with numbers that rocked the decade, some iconic, some surprising. For a night of toe tapping, thigh slapping, singalong (not too loudly!) tunes, this is going to be a highlight. Once again directed by Peter Mitchell, whose dislike of 80’s music makes this an ordeal for him, the show is just the thing for all you 60’s and 70’s babies! Picnic evening: bring your food, but no drinks as there is a cash bar. Tables seat 10, but you may book for less.